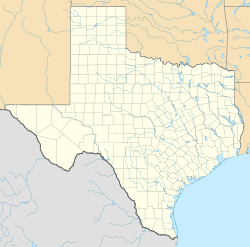 Coupland (/ˈkoʊplənd/ KOHP-lənd) is a city in southeastern Williamson County, Texas, United States. According to the 2014 Population Estimate of the United States Census, the population was 298. Coupland is home to the Coupland Inn and Dancehall, an eatery, bed and breakfast, and dance hall which has been in the community for nearly 100 years. Coupland's athletic teams are the "Cowboys." The Coupland Independent School District serves area students. Coupland ISD serves grades K-8. Upon graduation, the students either go to Elgin, Texas, Pflugerville, Texas or Taylor, Texas for high school courses. In 1859, Morgan C. Hamilton bought large tracts of land along Brushy Creek from Shiloh to Rice's Crossing. Hamilton died in 1883, willing the land to his nephew, Theodore Van Buren Coupland. 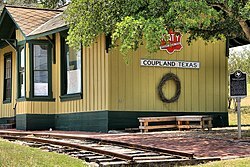 Mr. Coupland sold a 100-foot right-of-way to the Taylor, Bastrop and Austin Railroad in 1887. Two Taylor men subsequently formed the Coupland City Corporation to subdivide and sell land for the newly formed unincorporated community of Coupland. Coupland residents voted overwhelmingly to incorporate on November 6, 2012, the 125th anniversary of its founding. The City of Coupland held its first City Council elections on May 13, 2013, with Jack Piper running unopposed for Mayor. Coupland is located at 30°27′25″N 97°23′33″W﻿ / ﻿30.45694°N 97.39250°W﻿ / 30.45694; -97.39250 (30.456924, -97.392367). These coordinates place the city just to the south of the city of Taylor, just east of the city of Pflugerville and north of the city of Manor. According to the United States Census Bureau, the city has a total land area of 1.926 square miles (4.989 km²) and a total water area of 0.026 square miles (0.067 km²). ^ a b c "US Gazetteer files: 2010, 2000, and 1990". United States Census Bureau. 2015-06-12. Retrieved 2015-06-12. ^ Source: Breaking News: Coupland elects its first City Council! This article about a location in Williamson County, Texas is a stub. You can help Wikipedia by expanding it. This page was last edited on 25 December 2018, at 20:48 (UTC).